It is Labor Day. We awoke to chilly temperatures and skies that turned from partly cloudy to overcast as we ate breakfast. She Who Must Be Obeyed suggested we check out the Cleveland Metroparks’ Lake-to-Lake Trail. The trail, which we had never visited, runs along the eastern edge of the Berea area and into Middleburg Heights. One of the uniquely decorated wooden deck bridges on the Lake-to-Lake Trail, this one features metal cutouts of dragonflies, each identified with a plaque mounted to its supporting post. We were delighted with the experience, though both a bit sore upon return. Putting in a total of 5.4 miles, we covered most of the trail from Lake Isaac north to Lake Abram and back with a very pleasant stop at an Aladdin’s Eatery (a lovely advantage of suburban trail hiking) for lunch. We stopped many times along the way to photograph plants, flowers, and wildlife including a very cooperative Green Frog and red dragonfly (Ruby Meadowhawk? ), residents of a tiny pond area. 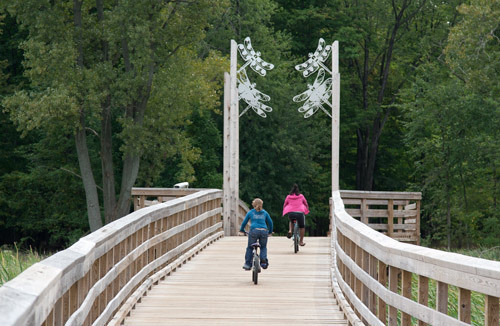 The trail is mostly asphalt paved with an extensive system of wooden boardwalks and bridges to carry visitors over wet areas. 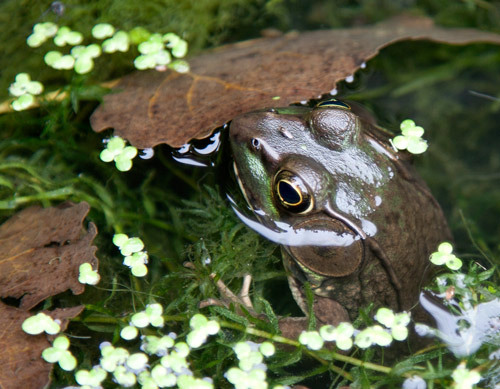 A Green Frog watches warily but allowed surprisingly close encounters by two photographers and their macro-focusing cameras. It was exciting and reassuring to see, from the trail, large expanses of marsh habitat undeveloped and preserved as natural areas in suburban Cleveland. And what a marvelous resource for area residents. Like us! 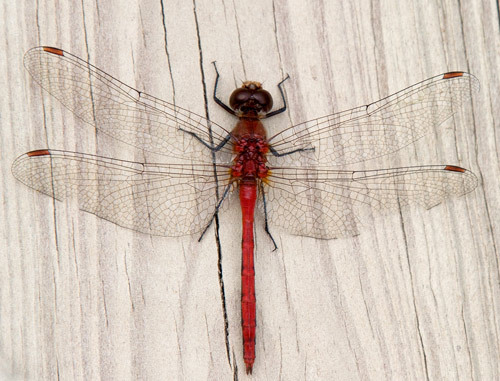 A red dragonfly (possibly a Ruby Meadowhawk) sat on a bleached wood railing as if posing for its portrait. The beautiful insect allowed two of us to make close approaches with cameras before flitting off into the reeds of a nearby wetland. Beautiful photos as always James. I always enjoy your photography. Sounds like you had a very nice day. Thanks. It was a most excellent day and a very restful weekend! I hope yours was as enjoyable. Your new blog looks great! Your day sounds wonderful. Your photos beautiful! Need I say more? Thanks, Su! The blog structure has shaped up and I’m getting used to the interface. I’m still working out what role this blog will have vs. a photo sharing site I’m considering — not Flickr. I love the frog picture!! Wow, that is amazing. I am glad you got to get out on the trail and ride bikes, enjoy the outdoors, and take some fantastic pictures (as usual)! Great blog, James! Is there any way you can show your gravitar on your page so that there is something familiar here? (the pic that is next to your comments. You can also have it on the side of your page. There have been so many changes that when I get to a blog, I begin to get confused if there is nothing familiar. Just a suggestion but if you don’t want to, that is fine. Glad you are here, James! I do miss the “favorites” feature, as froggie would definitely be in my favorite pictures file! !